Anglers and hunters looking for their next vehicle need look no further than Toyota's newly redesigned Tundra, a workhorse that gets the job done in style. Toyota has been making the Tundra since 1999, and they combined their in-house innovation with input from previous Tundra owners to put together the 2014 version of the truck, which leads the full-size class of vehicles in several categories. Earlier this fall, Toyota unveiled the 2014 Tundra at Georgia's Barnsley Gardens, an outdoorsman's paradise in the rolling foothills above Atlanta. Highways with sharp turns, steep hills, and a mixture of stop-and-go traffic put the truck through its paces, while the off-road track at Barnsley Gardens gave drivers a taste of what the truck can do in the wild. One of the most notable features of interest to outdoorsmen is the Tundra's towing stats. It can tow up to 10,400 pounds, but even more impressive is that the Tundra is the only truck in its class that meets the SAE J2807 towing standard. This is an industry test that involves a complicated series of towing procedures, and while some manufacturers claim their truck's transmission or cooling system meets this standard, they are leaving out part of the story. Every component of the Tundra--the entire truck--is SAE J2807 compliant. No other full size truck can say that. Pulling that pontoon boat, camper, or trailer full of ATVs has never been easier. And while its towing capacity makes the Tundra a viable candidate for an outdoorsman's truck (it's possible to forget you're even pulling anything at times), the upgraded audio system, the comfort of the interior and the decreased road noise, along with the smoothness of the Tundra's ride makes this more than just a tow vehicle. The redesigned exterior gives the truck a more aggressive and attractive look, and is sure to turn heads in hunting camp, the interstate, or on main street. The Tundra's rear bumper is a unique three-piece design that allows the replacement of one, two, or all three portions. This means Tundra owners with a dinged-up bumper can replace only the necessary piece(s), keeping costs down. The lockable tailgate features and easy-up/easy-down system with no slamming, and can be easily removed. The Tundra is available in 5 packages--the SR, the SR5, the Limited, the Platinum, and the new 1794 edition. Three cab styles and three engine options make the Tundra an option for budget-minded outdoorsmen as well as those wanting every available option, and everyone in between. 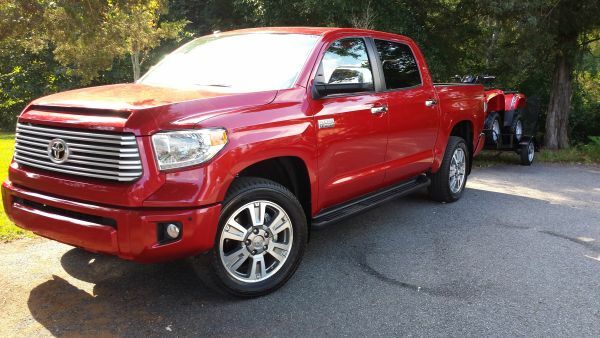 The 2014 Tundra is designed and built in the United States and is currently available at Toyota dealers nationwide.